We are about maritime education and tall ship sailing. 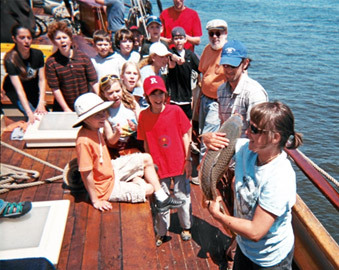 Our mission is to promote, encourage, and support involvement in the ecological and historical aspects and features of tall ships and the marine environment, by providing maritime-oriented educational programs and sailing mastery opportunities for adults and children onboard the tall ship Mystic Whaler. You too can join our crew. Donate to the Mystic Whaler Foundation. The Mystic Whaler Foundation, Inc. is an IRS non-profit 501(c)(3) corporation.